Pirate Kings APK 2.7.0 is a perfect choice for you who like to battle with your friends. This is said to be one of casual game. Basically, it offers easy steps to play. First thing first, all you need is just spinning the wheel. After collecting the prizes, then start building your own island. Yes, you need to steal the prizes as well after spinning the wheel! This makes you feel like you are the real pirate king. When you reach the top of leader board, you will discover more amusing things. You will see beautiful and exotic islands. That is why this game is more interesting if you play with your friends. This game is also allowed for above 3 years old which means that this game is safe and does not contain lots of violence. The thing is, this game gains 4.3/5 stars based on users’ opinion. The next good things from this game come from its incredible views and in-app purchases feature. The second feature lets you purchase using real money to get some kinds of special items from this game. Go spinning the wheel, stealing, attacking, and defending to feel the real atmosphere to become a pirate king! This game is free to download and install. The only weakness is just coming from lagging and a little bit bugs which are not great deals, really. Last but not least, all you need is just your 4.0.3 Android operation system mobile phone and 40 MB of storage capacity. 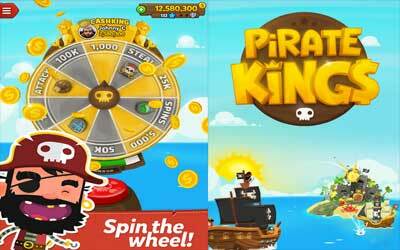 Pirate Kings which is developed by top developer vendor is exactly fun and entertaining to spend your leisure time. Connect with your friends today to have a battle with them and be in the top. Eventually, try to have a great island which is built by your own to get better achievement in Pirate Kings for Android. Battle your friends – attack, steal, defend!